A whole-food, plant-based diet is centered on whole, unrefined plants. It’s a diet based on fruits, vegetables, tubers, whole grains, and legumes; and it excludes meat, dairy products, and eggs, as well as highly refined foods like bleached flour, refined sugar, and oil. 8 principles and you may well find yourself becoming PLANT PERFECT! "Plant foods are the most abundant sources of nutrition on earth. Nutrients are the raw materials your body needs to function properly and can generally be split into two types – the ones your body can make by itself and the ones it can derive only from your food. The latter are called “essential” nutrients." "Dr Fuhrman’s system for rating the “nutrient density” of all foods is a can’t-miss reference for anyone looking to get the best quality foods into their bodies. ANDI stands for “Aggregate Nutrient Density Index. 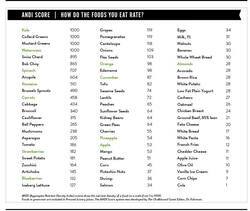 This index measures foods for a wide-array of nutritional qualities and rates them on a scale from 1 – 1000." Click Here for the article and index. A great Acid/Alkaline food chart showing the pH of foods in relation to their effects on your body. Click Here for the Charts. "The terminology 'carbs' is thrown around a lot these days with most people not even knowing what the word really means. Carbohydrates are NOT a food group! To say you are not eating carbs is to also say you are not eating vegetables, fruit, pulses, tubers, nuts, seeds, and whole grains such as quinoa, millet, oats, buckwheat, rye etc. - all of which contain carbohydrates! Yes eating large amounts of refined and highly processed starch products are not good for you, but by eliminating or minimizing the mentioned list of healthful foods you are also eliminating necessary essential nutrients from your diet." See also section on Diet & Your Health.